Last week I posted about a caramel apple pie. It was good, but the caramel didn’t turn out well. This week I learned from my mistakes and tried again. The second times a charm. In my earlier attempt, I don’t think I let the sugar brown enough before adding the cream. I also stirred the sugar and water mixture, which apparently is poor caramel sauce technique. David Lebovitz says when making a liquid caramel, which starts with water and sugar, you must have a very clean pan. He suggests not using a non-stick pan because the high heat can damage the finish and unhealthy chemicals could be released. I used a non-stick pan because that is what I had access too. He also suggests not stirring the sugar and water. Stirring encourages the sugar crystals to bump and stick together, making a crunchy, crystalline mess. This happened when I made my caramel apple pie. I read that a little lemon juice prevents crystallization, but I didn’t try it out. In my earlier attempt, my sauce didn’t bubble up enthusiastically when I added the cream. I’m not sure why. 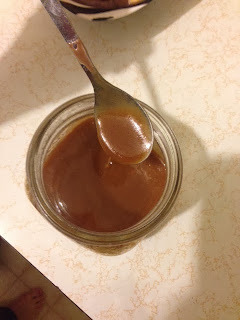 I have read a few blogs on caramel making, and this issue wasn’t addressed. I hypothesize that my sugar wasn’t hot enough. 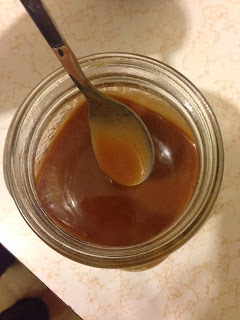 For the caramel, I used ½ cup white sugar, 1/8 cup water, ¼ cup butter, ¼ cup cream, and ½ teaspoon salt. I added the sugar and water to a pan. This cooked on low to medium heat until the sugar had dissolved and the water is clear. You don’t want the water boiling vigorously because you shouldn’t stir the mixture. There were just a few small bubbles. Once the sugar has dissolved, I added the butter. This is again brought to a slow boil. I cooked the sugar syrup until it had become a deep brown, but it wasn’t burnt. When the color was dark enough, I took the pan of the hot burner and added the cream. This time the sauce erupted in vigorous bubbles. I stirred the sauce over low heat until everything melded and merged together nicely. I also added the salt. I let this cool a while before eating any. It’s hot, and you could seriously burn your mouth. Once it cooled, I stored it in the refrigerator. Yum! This would be wonderful on ice cream, pie, cake, or waffles. It’s also excellent by the spoonful. It’s a thick, rich, and creamy caramel that is sure to fit all your caramel needs.